In Brake Failure by Alison Brodie, Ruby is a woman who has always done the proper thing and whose game of one-upmanship with her sister, Claire, has defined her. On the cusp of her ultimate win, living Claire’s dream in Paris, Ruby’s husband is instead sent to work in rural Kansas. Once in Kansas and with no one left to impress, Ruby starts living for herself and the heady freedom is something she’s never experienced before. What’s a woman with extreme brake failure to do? The author, Alison Brodie, gave me a copy of this novel in exchange for my review. Ruby Mortimer-Smythe is a caricature at the start of Brake Failure. She is living someone else’s life and is overly concerned about the presentation of her life to her sister. When first in Kansas, she doesn’t answer the phone when Claire calls and is perhaps a bit too vexed when Edward, her husband, does and doesn’t apply the proper spin to his conversation. He thinks her posing is dumb (as the audience likely will) but, for Ruby, it’s truly all she has. Ruby sees herself as nothing without the perception of living better so when all hope is lost, she reverts to a freedom often enjoyed by teenagers who are testing the limits with their parents. While perhaps not seeing herself as immortal, she sees her own mortality without freedom less a pressing concern. In fact, she realizes that her marriage was a result of the living for someone else and the new and exotic men of Kansas are perhaps more a temptation than she anticipated. I will admit to having a hard time getting into Brake Failure. The book begins in modern-day Kansas with the sheriff and then floats back to England and Ruby’s competition with Claire. Claire is a boiler-plate, vacuous airhead as seen from Ruby’s perspective. Ruby, for her part, is anxious in her role as the nemesis, but it’s really all she’s known. Once she gets to Kansas, the story takes a turn. Ruby starts to morph from a one-dimensional stereotype to a real person and finally breaks free of the literary box in which she’s trapped. When she meets Sheriff Hank Gephart, Ruby is ready to become a person outside of expectation, leading a routine traffic stop that was going fairly well for her to turn hostile because Hank represents rules and Ruby is no longer living by the rules. 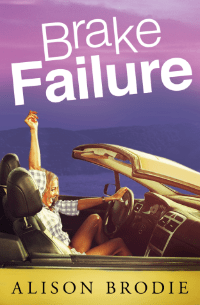 The humor of Brake Failure is reminiscent of Fannie Flagg and Mark Childress. Ruby is manic. Edward was about convenience but she’s convinced that she hates Hank and the routine he represents while nursing an undeniable attraction to him. Ruby takes the reader on a manic ride not only through her love life but through her daily life where she makes pithy and unguarded observations about the good people she encounters. One especially wonderful and witty encounter is with a local shop girl who believes that Ruby has inside knowledge of the Queen and Ruby doesn’t disabuse her of the notion telling her, among other things, that the Corgi’s bite. Once in Kansas, the flow of the piece is smooth and fast with perspectives alternating. There’s a practiced ease to Brodie’s writing that gives a vivid picture of both setting and offbeat local characters. Despite the foreign setting, Brodie shows a respect for people that could easily be solely for comic relief (often found in television and fiction) and writes them as real, heartfelt and welcoming and, ultimately, cathartic for Ruby. If you like southern fiction, you will adore Brake Failure. It’s one of the better outings of the genre that I’ve read though I advise readers to hold on for the first third if the story doesn’t immediately grab them. Brake Failure is a gem of modern literature. Check out our review of Alison Brodie’s Zenka. For more information about Alison Brodie visit her website. You can connect with her on Goodreads, Facebook, Pinterest, Google+ and Twitter @alisonbrodie2.